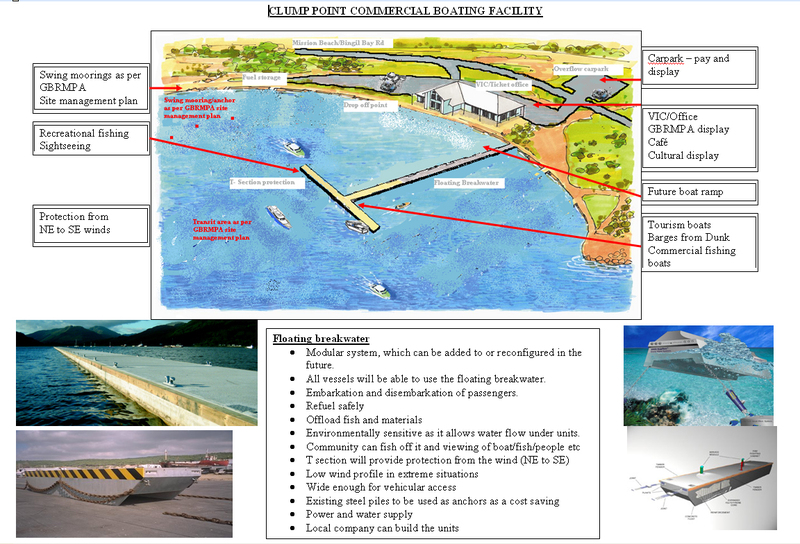 At the end of 2011 the Cassowary Coast Regional Council (CCRC) engaged GHD Consultants to meet with Mission Beach stakeholders concerning the future of the Clump Point Jetty. The consultants were supplied with a list of stakeholders by the CCRC which included representatives from tourism, commercial boat operators, traditional owners and government departments. Full representation from the conservation sector was not included in this initial consultation. There has been strong interest from the community regarding the environmental impact of any of the proposals to date for marine infrastructure at Clump Point. Community concern was demonstrated as recently as March 2011 with a comprehensive presentation to Council specifically about the Clump Point Jetty. GHD developed a list of scenarios reflecting the ‘wants’of the stakeholders consulted. These scenarios were then presented at a public information day on Tuesday 13th December last year at the Mission Beach Resort. The GHD options offered are either very costly or impracticable on this exposed, high-energy coast. Large posters on display showed the locations considered for each of four ‘options’. These options have not been backed by engineering or feasibility studies. As presented, none of them are environmentally acceptable because they include rock walls and a large concrete embayment. At the information presentation we were told the GHD information sheets could be viewed on the CCRC website from Friday 17 Dec and that community feedback was encouraged. The posters never made it onto the site and there has been no call for any further feedback. Why are Mission Beach locals being subjected to discussion of rock walls and marinas when there is no money for such facilities? It has been made quite clear by the QRA that the $5.5m allocated for the repair and reconstruction of the Clump Point and Dunk Island Jetties is to be used only to reinstate what was there prior to the cyclone. That is, a jetty. From an environmentally and socially appropriate point of view, the preferred facility would be an attractively designed T-ended jetty with steps and landings and two single removable pontoons secured to piles. This would best serve the present recreational and local tourism vessel operations. All the designs presented by GHD would have to go through the normal assessment processes at all levels of government. DERM have made it clear that a state assessment would take at least two years. Should any of these rock walled options be seriously considered, the Clump Point jetty would again be left in a decrepit state, local tourism opportunities would be lost, and the community would continue to have no serviceable jetty for recreational use. The Council will now have to deal with community division created by unrealistically raising some people's hopes for marina-type rock walls (for which there is neither money nor engineering studies nor approvals) while alienating others and blatantly excluding conservation interests from the initial stakeholder consultation. Of the options offered by GHD, only the jetty part of option 2 is acceptable as a practical and stable landing for recreational and small tourism vessels. Options 1, 3 and 4 (and stage 3 of option 2) are completely unacceptable. GHD Option 2 - jetty with floating attachments and/or concrete embayment has been presented in three stages (shown below) and is promoted as the 'Prefered Option'. Stage1) A basic straight jetty without side extensions. Jetties can be built to appear low-key, visually attractive and culturally appropriate, suggestive of the romance of island and coastal life. Jetties can be visually appropriate as the gateway between two World Heritage Areas each listed for its natural values. steps allowing access to the water at all stages of normal tides. A further short cross piece could be added part way along the jetty, complete with cyclone resistant shade, as a fishing alcove for locals and visitors. The concept below is favoured by conservation groups. A holiday recreational atmosphere can be encouraged by suitable permanent (metal) "sail" coverings (as on The Strand Townsville, above right). At least one of the sets of steps should lead to a pontoon riding on its own piles and suitable for use by recreational and small commercial craft. The piles need not be higher than a metre or so above Highest Astronomical Tide ( HAT) if the pontoons are sinkable readily detachable for safer stowage ashore (where?) should a cyclone threaten. The structure must not encourage storage of vessels. Stages 2 and 3 have a number of serious problems. Stage 2) A straight jetty flanked by two long parallel floating pontoon walkways. Each pontoon string has a sliding ramp for access at one end and at the other end a steel platform on a pontoon which accommodates the tides by moving up and down on piles. The use of pontoons has some merit, but not as pictured below, on this exposed high-energy coast. Placement of pontoon strings in a wave break or wave build-up area. The consequences of strong wave action acting on a series of unsecured pontoons have not been taken into account. The long parallel pontoon walkways are free to move in any direction (including sideways). The ramps from the jetty to the pontoons must be 20 to 30 metres long if they are not to be too steep for safe access at the lowest tides. In the pictured arrangement in this exposed setting, bridging ramps will suffer extreme stress and wear and will break free in strong weather. To accommodate the combination of HAT and wave action in normal strong weather (eg 20 - 25 knots), the pontoon piles will have to reach a good 6 metres above LAT. Depending on the height of the seabottom at this location, this would require very long piles structurally strong enough (diameter, wall thickness, solid or hollow etc) to stand the required height (say 10 metres) above the seabottom, plus a further length of some metres driven into the seabottom. Human safety has not been taken into account. There are always people who walk past barriers, enjoy the excitement and thrill of riding a bucking pontoon walkway in rough weather, or just want to defy authority. Is it wise to provide a way for people to access such long unsecured pontoons in this exposed and active area? The jetty, by comparison, provides stable footing. The pontoon walkways in Breakwater Marina Townsville are extremely well protected from wave action from the sea, nevertheless these became very active during Cyclone Yasi. Many pontoons (and at least one walkway) were seriously damaged and became unsafe. Some pontoons turned over, exposing steel tie rods and other broken structural parts; and one of the main walkways (C-finger) broke loose at the shore end. Despite warning signs and barriers, people continued to use C-finger, jumping over the broken connection. Within this well-enclosed basin setting broken/sunken pontoons had no serious consequences; the damaged sections were simply fenced off or towed away and "resident" boats were moved to safer berths. For the exposed Mission Beach coast, these lessons from Breakwater Marina Townsville (a well-protected boat basin) need to be well-heeded before installing pontoon-supported walkways: where would they be stowed when a cyclone is imminent? Who would carry out the task? Would it be considered safe to do so? The end steel floating platforms will be lethal in strong weather if not rendered sinkable. CCRC staff would need to be dedicated to carry out this task before it became unsafe to do so, and to keep people off the walkways, every time strong weather threatened. Stage 3) A straight jetty with a large (100m long x 30m wide) embayment created by an additional jetty or wharf construction straddling the original jetty's outer end. Attached to this jetty are proposed solid concrete walls rising 5.5 metres above Lowest Astronomical Tide, turning the whole into an ugly 100m long wharf (with 30 metre side arms) to create a crude marina. Information accompanying GHD Option 2 quotes a cost of $16m above the cost of the jetty repair. It makes no reference to any environmental impact and on the information day it was stated by the consultant representative that this option would be approved by DERM. An extra information box (below) makes the point "future proof to enable additional features to be installed in the future"
This is the more obviously unacceptable of the drawings presented by GHD as additions to the existing or replacement jetty. It is clearly a marina by stealth. The only reason to create a solid structure of this size and shape is for storage of vessels. Although the concrete "screen" as proposed has no immediate contact with the sea bottom, it is in fact a solid wall suspended on many piles, creating a large embayment with all the hydrological, environmental and visual mpacts of a rock wall, including light exclusion. The concrete wall does not cater for all states of tide (normal conditions). At Lowest Astronomical Tide (LAT)very little of the wall is in the water, so some wave action will penetrate to the boat landing and storage area. metre-long, sheer vertical concrete structure will tower 5.5 metres above the water (and will require many ladders/steps to access the water); and - what an invitation to graffiti!! 160 m x 5 m x 2 sides!! - as one sees on concrete walls in industrial ports. Because that is what it will look like. The lower parts of the wall will become a substrate for marine growth unless they are painted with antifouling paint (toxic to all marine life).This structure is absolutely unacceptable as the gateway between two World Heritage areas renowned for their unique scenic beauty. Imagine arriving by sea and watching this monstrosity looming against the Mission Beach rainforest. cyclonic wave action of Category 3 and greater? What will happen when it fails? How much damage will the wreckage do to the benthos and the Mission Beach shoreline? The GHD depiction of the concrete "wave screen" section is not to scale. Option 1 is the same as Option 2 except that a rock breakwater is proposed instead of the high concrete wall. There were no drawings for options 3 or 4 but both have rock walls as above and the summary boxes (below) outline some of the drawbacks of the designs i e adverse environmental impact, difficult vehicle access, services, car parking not available etc. rock wall and other "hard" construction and/or reclamation are recognised in State policy as being damaging to coastal processes. Queensland Govt policy is to maintain natural coastal processes and use hard structures only as last resort, to protect property. apart from the loss of important benthic habitat including seagrass under the immediate "footprint" of the structure (benthic biodiversity being a basis of marine life), these proposals would result in substantial changes in the coastal hydrological regime with ongoing changes in coastal hydrology to north and south. Nearby benthic communities would also be affected. This exceptionally beautiful and dramatic coastline is famous for its "World Heritage meets World Heritage" natural scenic beauty. Human-made walls, whether rock or concrete, are a stark contrast to nature's infinitely varying rocky shorelines and the softer sections of sand and foliage. Rock walls shatter the appearance of an unspoilt coastline. These visual changes are not compatible with World Heritage protection and presentation. Nor are they compatible with the National Landscapes Program, which has identified (from commissioned economic studies) that the Australian Tourism Industry's best hope for weathering the future economic world is niche-marketing; that is, to promote what is unique to each regional and local area, focusing strongly on the natural environment and a unique local culture. Marinas and rock walls are commonplace across the world. under the current statutory coastal plan these proposals would be unlikely to get approval ("no adverse impact" in a Area of State Significance (Natural Resources)); under the new (not yet implemented )Coastal Plan, they would require the declaration of a Maritime Development Area (MDA) and a full EIA process. Approvals would also be required from the GBRMPA and under Native Title legislation. without a full feasibility study and engineering plans, the proposals pictured cannot be properly costed; they are likely to cost substantially more than as suggested in the presentation. substantial permanent structures creating an embayment amount to a "marina by stealth". The above was compiled using information gained from the public information session and with advice from Alliance to save Hinchinbrook (ASH). If they consulted with conservationists they would hear things they don't want to put in their report. This kind of 'community consultation' is not worth the paper it is written on and the word 'stakeholder' should no longer be used- it means those who will profit from the investment. I can't help but wonder! were any of the previous reports regarding cassowaries habitat retention, along with deforestation issues, even perused during this whole 'community consultation'? On the grounds that the community, as a whole, or (in the true sense of the word) were not consulted! surely any outcome could be legally deemed forfeit? In response to Susan Hawthorne ~ your spot on Susan, and I guess we see now, that the 'stakeholders' (those who will profit from the investment) surely are doing just that! The State FNQ2031 plan specifically states development at Mission Beach is to be constrained in recognition of the threats to the cassowary. A marina catering for the wants and not the needs of the community is following the same growth pattern that is associated with the short term economic gain and destruction of the special values of so many other places developers have now moved on from. The public information day was advertised and we expect our community group representatives to keep us informed when these opportunities arise to have input. All the senarios presented are unrealistic, would have to go through a lengthy assessment process and do not consider any of the input from the conservation sector. Not one of the options shown by GHD show a jetty upgrade which is what they were commissioned to do. A waste of taxpayers money and creates community division. Up to date news and current issues of concern or interest about the future of Clump Point/Boat Bay.